Approximately 1 species in Santa Cruz County. Phloeomana is a recent segregate from Mycena, and in some respects the fruitbodies produced by Phloeomana speirea are quite similar. They are small, fragile, with translucent-striate caps, and grow on wood. However the caps are more rounded and umbilicate (not conical), the gills are widely spaced and decurrent, and the stipe and cap are punctate-scurfy. This species is saprobic, growing on the bark of standing trees and well-decayed hardwood logs. Only one species occurs in our area. It is uncommon to fairly frequent in winter and spring. The fruitbodies wither quickly when the air is even a little dry, so detection is best done during wet spells when there is high ambient humidity. Identification is dependent on generic placement. 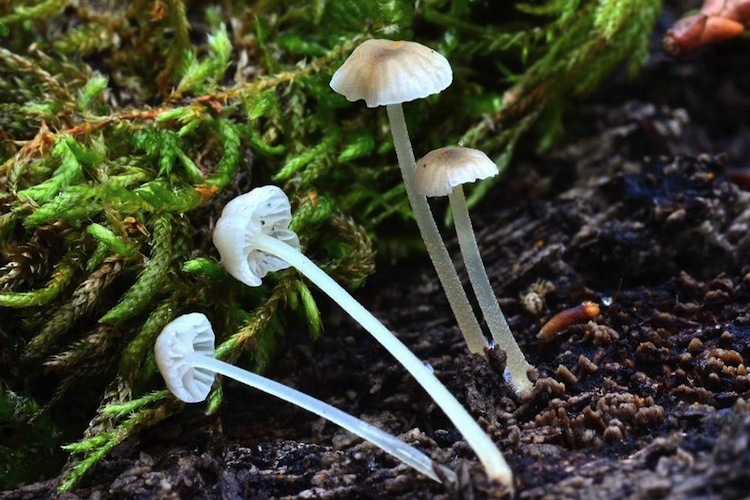 Other similar genera include Hemimycena, with much whiter fruitbodies overall, Fayodia, some Rickenella (usually growing on moss, not wood), and a few Fayodia with larger caps and thicker stipes. Basidiomes mycenoid, fuscous, on bark and decayed phloem. Lamellae broadly attached, with decurrent tooth or arcuate. Basidiospores nonamyloid, smooth, thin-walled. Pileus tissues nonreactive in Melzer's reagent, not encrusted. Cheilocystidia abundant, only slightly differentiated from basidia. Pleurocystidia absent except near lamellar edge. Pileipellis hyphae with branched excresences. Stipitipellis hyphae smooth, with patches of irregular cystidioid end cells. Holotype: Agaricus speireus, Fr. 1815.